Saturday Route withdrawn in favour of new 6B and regular Route on 6A. RTW type replaced by new RM type. Willesden (AC) RM type replaced by new RML type. Route 6A on Saturday restricted to limited peak Route therefore Saturday 6 reintroduced but only as far as Warwick Avenue Station. 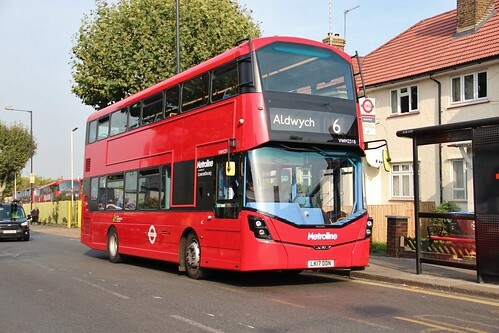 Saturday extended from Warwick Avenue to Kensal Rise to compensate for withdrawal of Route 6B but withdrawn between Aldwych and Hackney Wick which was replaced by a regular Saturday Route on 6A between Marylebone Station and Hackney Wick. Withdrawn between Hackney Wick and Leyton Town Hall. Kensal Rise and Aldwych / Oxford Circus and Hackney Wick. This in actual fact was the 6A withdrawn between Oxford Circus and Marylebone and renumbered 6. Hackney Garage closed - new Ash Grove allocation introduced. Sunday AC allocation withdrawn and remainder converted to One Person Operation. AG allocation withdrawn. Sunday AC introduced. Mon-Sat BW allocation introduced. Withdrawn between Aldwych and Hackney Wick but replaced by new Route 26 Waterloo and Hackney Wick. MS evening Route converted to OPO. Converted to OPO - and route now 24hr as "N" prefix dropped.